September 8, is commemorated as the feast of Our Lady of Good Health. 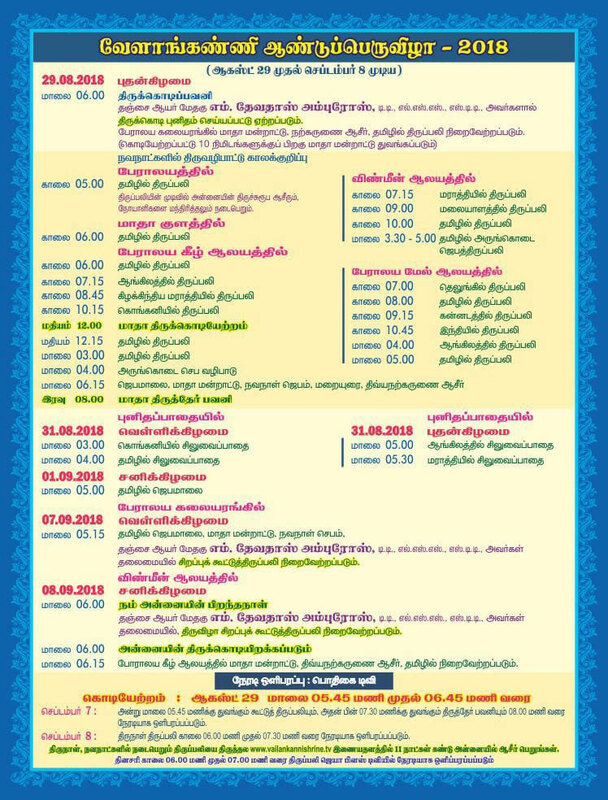 The celebration starts 29 August and ends on the day of the feast. 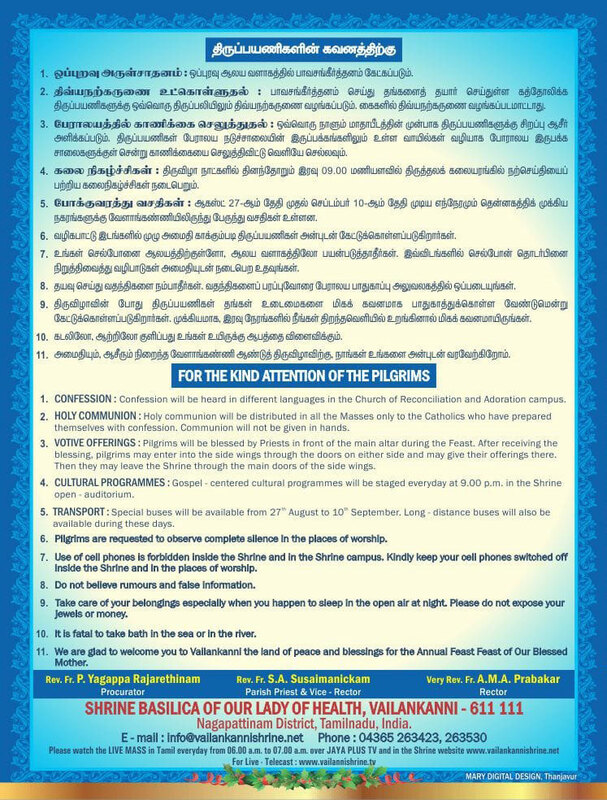 The feast day prayers are said in Tamil, Malayalam,Telugu, Kannada, Konkani, Hindi and English. The Lady came floating in her car, shouldered by her footsoldiers of faith. And as she floated along the teeming thousands, her faithful knelt, some with open palms, some with absolute supplication – each with their own reason for reverence and surrender. 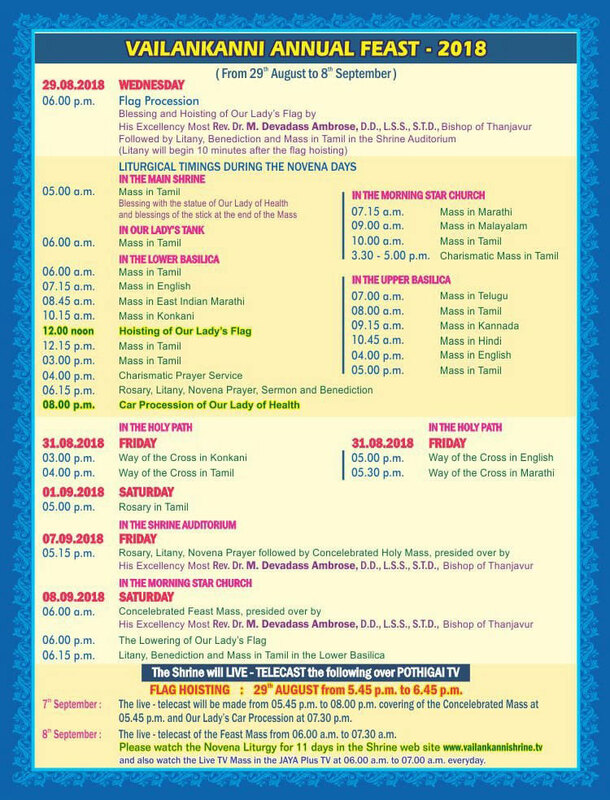 Tuesday evening marked the penultimate day celebrations of the Velankanni Feast – the Velankanni car festival spruced with as much grandeur as the flag hoist ceremony, a week before. As if a metaphor, against the darkness of the late evening sky, the only light was from the shrine and the cars that carried the Gods. The car procession that commenced at half past seven – was harbingered by the occasional crackers against the dark sky above trailing the movement of the cars down below. From above, it was picturesque, like a floating car in a sea of humans. Five life-size screens were poised at locations for the benefit of the pilgrims that ran into tens of thousands. And for once, absolute supplication looked endearing – with each believer, soaking in the beauty of Our Lady of Health, with star-lit eyes and prayers galore. 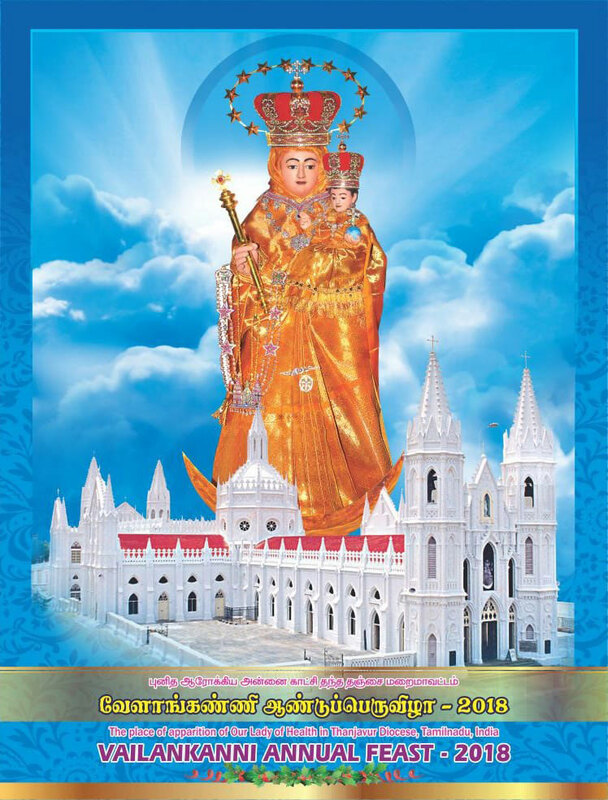 Each bespoke the call for myriad blessings, and amid the resonating hymns, the six cars floated ahead and the final car, carrying the Lady of Velankanni drifted her way and poised herself in front of the shrine for the sake of the blessed. For the thousands, who had thronged and lodged themselves hours before the procession, it was a penance of sorts – one that saw its expression in their star-lit eyes, rested bodies, and pleading-open palms in defenseless submission to the lady almighty – as calls for ‘peace among nations’ and ‘love among people’ was made along the trail of the cars. It is said that those, who shouldered the car would be decided by the Parish on the basis of requests made by the faithful. While, the six small cars were shouldered by women, the final car with the Lady of Velankanni was carried by men. It was as if the grandeur of the event could only be matched by the grandeur of the reverence of the thousands gathered there.